Receive our warmly and lovely greetings from Togo! Dear Pastor and Brethren, ...my mom passed away on Thursday, December 27th... .
Dear Pastor and Brethren, Justine has been hospitalized a couple of times... .
Dear Pastor and Brethren, We thank God for the high privilege He gives us to serve Him. . .
Dear Pastor and Brethren, May our warm greetings reach you in our Lord's love. 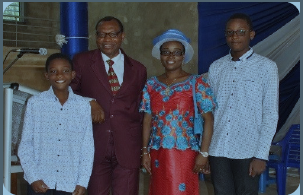 . .
Dear Pastor and Brethren, Receive our lovely greetings from Togo. We are thrilled to share with you what our Lord and Savior is doing through you and us around here. . .